These gorgeous flowers are delivered "ready to arrange", perfect for those who like to get creative. 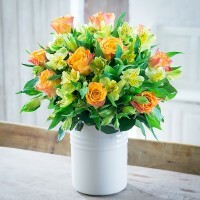 However your recipient chooses to display these super blooms, they won't be disappointed with the abundance of gorgeous orange roses and yellow alstroemeria. A great value gift.